Adelaide United Youth were no match for Adelaide City as the Black and Whites continued their perfect start to the 2017 PlayStation 4 SA NPL season with a resounding 7-1 victory at The Parks Football Centre on Saturday night. 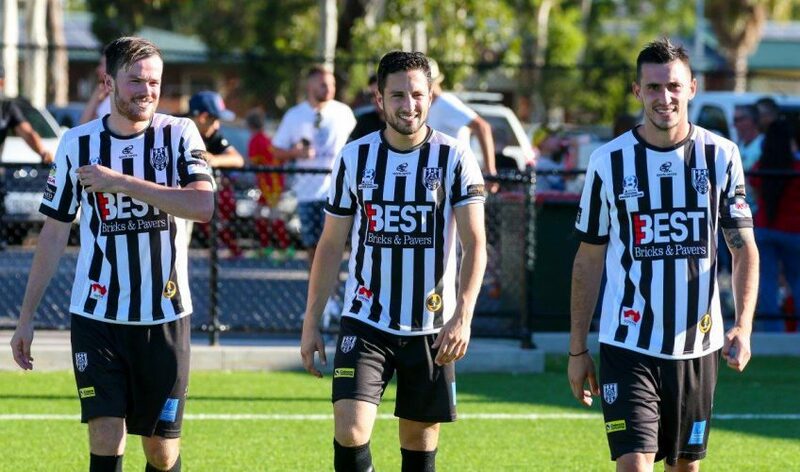 The win was enough to send City to the top of the NPL ladder, while their counterparts were unable to register their first points of the new campaign and subsequently were sent to the bottom of the table. It was a frantic opening to the match and United had the first major chance of the game in the 15th minute through their skipper – former City man Josh Mori. Mori collected the ball at 25 yards, and beat City goalkeeper Luke Ostbye, but smacked against the crossbar. It was an entertaining opening half-hour of football, and in the 32nd minute it was City who finally broke the deadlock. Anthony Costa received the ball just outside the 18 yard box and turned a United defender before placing a shot into the bottom left hand corner of the net with his left foot. It was a brilliant strike from last season’s top goalscorer Costa, who continued his impressive start to the season. The Black & Whites continued to dominate the first half and were awarded a stoppage time penalty after Jordan Maricic brought down Anthony Costa in the box. Nicholas Bucco slotted the penalty home past Cameron Cook, and sent City into the half time break two goals to the good. United endured a nightmare six minutes in the second half, and it was Dylan Smith who made it 3-0 in the 57th minute. Three minutes later, Jordan Pudler made it 4-0 and put the game beyond doubt in spectacular fashion. The midfielder had the ball outside the area, and spotted Cook off his line before launching an inch-perfect lob over the top of the United keeper. In the 63rd minute, Substitute Mamadi Kamara made it 5-0, with a solo effort which saw him drive the ball into the bottom left corner. United pulled one back in the 73rd minute through Apostolos Stamatelopoulos after he fired a shot past Ostbye. City continued their dominance three minutes later, and it was Anthony Costa for the visitors, scoring his second of the game. A corner was swung in by Bucco, finding Costa, whose bullet header was too much for Cook. It was Costa’s fourth goal in three matches. Finally in the 90th minute, it was former United man Evan Kostopoulos haunting the club he once represented at A-League level by completing the rout with a well-timed finish into the bottom right. Damian Mori was sure to be pleased with his team’s solid performance, with six players getting on the scoresheet in style. The win builds on City’s confidence as they return to Adelaide City Park next Saturday afternoon to take on Adelaide Blue Eagles.